For other people named Tim Thomas, see Tim Thomas. Timothy Mark Thomas (born February 26, 1977) is a retired American professional basketball player. Thomas enjoyed a solid rookie season, averaging 11.0 points per game, and was named to the NBA's All-Rookie 2nd Team. The Sixers would grow impatient with a sophomore slump from Thomas, though, and in 1999 he and Scott Williams were traded to the Milwaukee Bucks for Jerald Honeycutt and Tyrone Hill. Milwaukee was enamored with Thomas's raw talent and versatility, and hoped he could blossom into a star with more seasoning. It looked like things were coming together for Thomas during the 2000–01 season, when he averaged a career-high 13.4 ppg for the Bucks. On January 5, 2001, Thomas connected on eight three-point field goals in the second half of Milwaukee's 119–115 loss to Portland. During his time with the Bucks, then-teammate Ray Allen was quoted as saying, "If he wanted to, Tim Thomas could be the best player in the league." Nevertheless, after a strong playoff performance that year, Thomas signed a new deal with the Bucks worth roughly $66 million over six years, despite being offered more money by Chicago. On February 16, 2004, Thomas was traded to the New York Knicks in a three team trade that also included the Atlanta Hawks. The trade also sent Keith Van Horn, whom Thomas was also traded for during the 1997 draft, from the Knicks to the Bucks, Nazr Mohammed from the Hawks to the Knicks, Joel Pryzbilla from the Bucks to the Hawks, and Michael Doleac from the Knicks to the Hawks. During game 1 of the Knicks' first round playoff series against the Nets, Thomas suffered an injury that kept him out of the remainder of the playoffs, when he was fouled by Jason Collins and taken out of the game on a stretcher. The incident started a long feud with Nets forward Kenyon Martin, who Thomas called a fake tough guy, that continued past both players' playing careers. In 2017, Thomas rehashed their feud on an episode of the Scoop B Radio Podcast. Thomas told Brandon Scoop B Robinson that he'd like to settle his feud with Kenyon Martin once and for all with a boxing match. The proceeds would go to the charity of their choice. Martin declined. 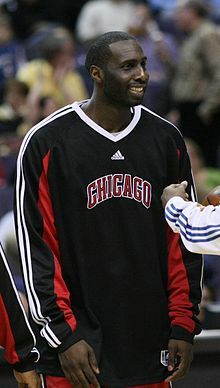 Prior to the 2005–06 season, Thomas was traded to the Chicago Bulls, along with Jermaine Jackson, Mike Sweetney, a 2006 1st round draft pick, a 2007 1st round draft pick, a 2007 2nd round draft pick and a 2009 2nd round draft pick, in exchange for Eddy Curry, Antonio Davis and a 2007 1st round draft pick. Playing in the final year of his contract, Thomas was given minimal minutes from the rebuilding Bulls. After playing just three games for Chicago, Thomas was deactivated while dealing with ankle and back injuries. After not playing for nearly four months, Thomas was granted his release from the Bulls. On March 1, 2006, Thomas agreed to terms with the Phoenix Suns to a contract for the remainder of the season. He made his debut with the Suns two days later, scoring 20 points off the bench in a 123-118 win over Orlando. Playing alongside reigning NBA MVP Steve Nash (who won a consecutive MVP award that year), Thomas rejuvenated his career in Phoenix. In the playoffs, Thomas played a crucial role in the Suns run to the Western Conference Finals. Starting in place of injured All-Star Amar'e Stoudemire (who did not play the entirety of the playoffs), Thomas scored a game-high 22 points with 15 rebounds in a game 1 victory in the first round over the Lakers. In game 6, Thomas hit the game-tying three at the end of regulation and an important three-pointer late in overtime to seal the Suns win. The Suns won game 7, overcoming a 3-1 series deficit. In the Suns' second round series against the Clippers, Thomas was credited for his defense on Elton Brand, helping the team to another seven game series win. In the Western Conference Finals, Phoenix fell to the Dallas Mavericks in six games. In game five of that series, Thomas "blew a kiss" to Maverick Dirk Nowitzki, who then proceeded to score a total of 50 pts for the game. Thomas expressed an interest in re-signing with Phoenix, though the Suns were over the salary cap and expected Stoudemire to return as their starter. On July 13, 2006, Thomas signed a four–year, $24 million contract with the Los Angeles Clippers. He frequently started in place of Elton Brand and Chris Kaman, though Thomas himself also battled injuries. On November 21, 2008, Thomas and Cuttino Mobley were traded to the New York Knicks, in exchange for Zach Randolph and Mardy Collins. In his return to the Knicks, Thomas was reuinted with Mike D'Antoni, who was his coach in Phoenix. On February 19, 2009, Tim was traded again to the Bulls along with center Jerome James and guard Anthony Roberson in exchange for guard Larry Hughes just before the trade deadline. His second stint in Chicago was more successful than his first, as he provided veteran leadership to the young team, helping the Bulls make a late season push to qualify for the playoffs. Though entering the playoffs as the seventh seed, they were able to push their first round series against the defending–champion Boston Celtics to a full seven games. On July 14, 2009, the Bulls negotiated a buyout of Thomas's $6.5 million contract. On July 28, 2009, the Dallas Mavericks signed free agent Thomas. In late January, however, he left the team temporarily to take care of his wife, who had an undisclosed illness. In August 2010 Thomas agreed to a one-year deal with the Mavericks worth the veteran minimum. In September of that year, however, he told the club that he would not report to the team so that he could care for his sick wife. Thomas was on the Second NBA All-Rookie Team in 1997–98 season. He won The Sporting News Freshman of the Year during the 1996–97 season. Was three-time All American at Paterson Catholic High School in Paterson, New Jersey. ^ Burns, Marty. "6 Milwaukee Bucks With Glenn Robinson gone, Tim Thomas has a chance to prove that he's worth his big contract--and that he can fetch more wins than Big Dog". Vault. Retrieved 2019-03-14. ^ "There is no doubting Thomas will fill a void". Los Angeles Times. February 21, 2007. ^ Writer, Fred Mitchell, Tribune Staff. "THOMAS LATEST TO SNUB BULLS". chicagotribune.com. Retrieved 2019-03-14. ^ "Knicks deal Van Horn in 3-team trade". ESPN.com. 2004-02-15. Retrieved 2019-03-14. ^ Thomas: K-Mart's act is phony. Sports.espn.go.com (April 22, 2004). Retrieved on 2012-06-03. ^ K-Mart: Thomas' words mean nothing. Sports.espn.go.com (April 22, 2004). Retrieved on 2012-06-03. ^ "Kenyon Martin Responds To 50 Cent, Tim Thomas Boxing Challenge". RESPECT Magazine. Retrieved May 14, 2018. ^ Beck, Howard (2005-10-04). "Bulls' Curry Is Traded to Knicks". The New York Times. ISSN 0362-4331. Retrieved 2019-03-14. ^ "New York Knicks Acquire Eddy Curry In Five-Player... - NBA Trades". nbatrades.tumblr.com. Retrieved 2019-03-14. ^ "Chicago Sports News, Schedules & Scores - Chicago Tribune". www.chicagotribune.com. Retrieved 2019-03-14. ^ "Magic vs. Suns - Game Summary - March 3, 2006 - ESPN". ESPN.com. Retrieved 2019-03-14. ^ "Lakers vs. Suns - Box Score - April 23, 2006 - ESPN". ESPN.com. Retrieved 2019-03-14. ^ "Tim Thomas joining Clippers". ESPN.com. 2006-07-13. Retrieved 2019-03-14. ^ "NBA.com: Knicks not done dealing, pull off trade with Clippers". www.nba.com. Retrieved 2019-03-14. ^ "Sources: Knicks trade for Bulls' Hughes". Retrieved February 19, 2009. ^ Bulls buy out Thomas? ^ Tim Thomas won't play for Mavericks. Sports.espn.go.com (September 15, 2010). Retrieved on 2012-06-03. ^ " HIGH SCHOOL BASKETBALL;Top Schoolboy Prospect Pressed About the Pros", The New York Times, December 6, 1995. Accessed December 3, 2007.